UNK project have created a fresh design for Microsoft‘s offices located in Moscow, Russia. 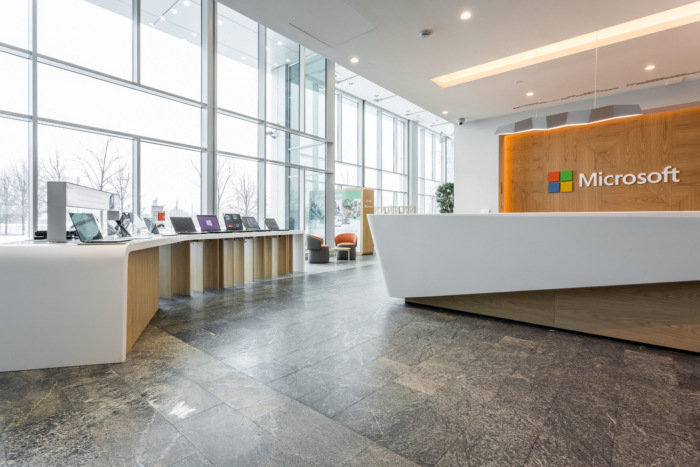 The architects faced the task of renovating the current office of Microsoft in Moscow. Renovation of offices around the world was thematic in nature, and in each country the subject was supposed to reflect national identity. The architects of the UNK project presented Russia through the history of its achievements. Thematic design pervades the entire office. Noticeable accents, for example, in the HUB solution. Since there are several of them in the office, the architects have devised for each of them those areas where Russia is a leader: literature, music, theater, fine arts. These images extend to the design of meeting rooms, in the form of an ornament on glass partitions on the floors. The theme is shown in the dominant color shade. Thus, the image of scientific achievements corresponds to a rich blue, the literary theme creates a soft shade of green.